American Express has reinstated the old Terms & Conditions for the travel insurance benefit that comes with The Platinum Card. There was a huge outcry from Head for Points readers when we highlighted the original change last week. To put it into perspective, the original article was read over 25,000 times on the site – this was DOUBLE the 2nd most read article last week. It was also read by our 13,000 email subscribers. What is the rule now? Here is a link to the travel insurance Terms & Conditions on The Platinum Card website. 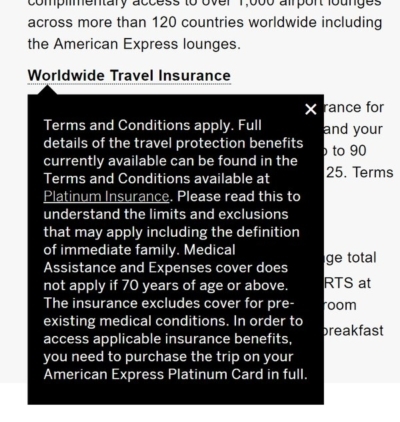 Last week, American Express changed the wording (under the definition of ‘Account’) to say that you must pay on The Platinum Card to be fully covered by the insurance. All of these cards are a better choice than paying with The Platinum Card which only offers 1 Membership Rewards point per £1 spent. The old wording has now returned. …. and still be covered. American Express has confirmed to me that the old wording is back permanently. How does the Amex Platinum insurance work? As a quick reminder, for medical and other ‘big stuff’, you are covered irrespective of how you paid for your trip. The insurance documentation – click here – has now been updated. …. which still insists that a Platinum card is used for payment. Hopefully this will get updated soon. Thanks to everyone who complained to American Express, either directly or via social media, following our article last weekend. In order to be fully covered by the Platinum Card car insurance, do I need to decline the car insurance that comes as standard with the car hire? I have two trip coming up shortly: one to the US, one to Sardinia. Plan to book through Avis. Advice would be appreciated. Thanks. As far as I know you don’t need to – Platinum picks up whatever you’d have had to pay up to its limits. If you keep CDW and your excess is therefore £1000, Platinum should cough up for it. It’s the complete opposite with most excess policies, ie you *must not* decline the free insurance that comes with your car rental or you’d invalidate the excess cover being offered by Plat or any of the excess ins specialists. What you decline at the car rental place is the optional (expensive) extra insurance. Decline whatever you can decline and AMEX will pick up the rest. In the US its common for car insurance to also cover rental vehicles so they are well versed to have ALL insurance removed, and then become 100% liable for any and all costs in an accident. AMEX plat also allows you to do this, but i would not be comfortable. I`d much rather limit my exposure to just the excess since the regular insurance costs almost nothing. Its the “Super CDW” that is the extortionate cost. I do agree that there is no benefit in declining something thats included free – and practically from a UK national’s perspective its virtually impossible to decline the CW element anyway. It is 100% full replacement. The old terms brochure used to say in big letters at the top ‘Decline everything – it’s on us!’ or words to that effect. I think the ammount of questions raised here ‘re Amex Platinum insurance cover have helped me come to the conclusion that it is risky for me to rely on this, particularly with health cover. I take Statins as my cholesterol level is just within acceptable levels but I believe that they are of benefit. Also I had investigations recently into a heart issue that thankfully resulted in a diagnosis of a benign condition. These two could I guess from reading the policy conditions result in refusal of cover in say a case of heart attack or stroke. Something I do not feel comfortable risking. Has anyone spoken with Amex ‘re cover when taking Statins? Also I would very much appreciate any recommendations for quality annual travel health cover, ideally without the Amex ambiguity. Most decent plans undertake a pre-health check nowadays so both you and the underwriter know whats what before you even purchase never mind travel. Staysure seems OK if you are their target vustomer. The important thing with them is full disclosure in which case i gather provided you play by their rules and keep them informef they seem to cover preexisting not always covered elsewhere. I enquired and they were very expensive compared with Lloyds Platinum account after a TIA. Why is this coverage not offered in the US? Totally OT as no bits but this is the closest link, I’ve just received my first ever email from Amex highlighting the alleged benefits of paying by flexible installments. Apparently it may be useful if I wanted to stock up the fridge?!? Are they hinting they’re not making enough money out of me? 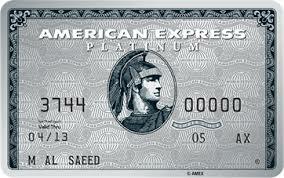 I signed up for the Amex Small Business Platinum Card and was approved on the 1st April. I received the priority card in the post but I still have not received the Amex card. Is this normal for the card to take nearly 2 weeks to arrive? The reason I ask is that I now only have 2.5 months to spend the £6k to get the 40k of MRs.
Ps. Thank you for this great site.